Flint is home to the largest privately held specialty pharmacy in the United States. Didn't think you would ever read that sentence, did you? But Flint is indeed home to Diplomat Specialty Pharmacy, a firm with more than 500 employees that is winning national business growth awards as well as the adoration of the Flint region for an ambitious plan that will add up to another 1,000 jobs over the next five years and 4,000 by 2028. That makes bio-medical a growing employment sector in a region so dependent on automotive. In fact, Diplomat’s $12 million investment in the Great Lakes Technology Center on the site of a former General Motors factory is the largest non-automotive economic development initiative in the history of Flint, said the city’s mayor, Dayne Walling. “The decision by Diplomat Specialty Pharmacy to move its headquarters into the campus was the keystone of this project's success,” said Walling, noting that the city is improving the commercial corridors and surrounding neighborhood in order to attract additional investment. Diplomat is an independently held health-care company providing medication management and clinical services to the nation’s sickest population, and those with the most costly and complex illnesses. In good times and in bad, Genesee County has been a good place for Diplomat, says Phil Hagerman, president and CEO of the company he founded with his father in 1975. When Flint’s economy started to tank, Diplomat was expanding its business nationwide, outgrowing its Flint Township plant. The original goal had been to de-centralize the company and build large retail distribution centers in the east, west, and south that would employ 250 people each, Hagerman said. But because of the state and local business climate and the availability of willing, able and talented workers, Diplomat decided to put 90 percent of new hires in Genesee. In a dismal real estate market, the company was able to buy the sprawling, empty General Motors facility last year and bring in even more talented local employees more than willing to get to work. Diplomat’s costs were significantly reduced as a result of a multi-million dollar tax credit from the Michigan Economic Growth Authority Board. The company worked closely with the Genesee Regional Chamber to secure job creation, brownfield redevelopment tax credits, and workforce support. The city of Flint and the Michigan Economic Development Corp. also provided significant incentives and benefits. The building has become a bigger game change for Diplomat than expected. "Moving into this 350,000-square-foot office complex with another 200,000-square-foot warehousing space in back is a clear indication to our industry that we have arrived and are a serious player," said Hagerman. In fact, Genesee County’s greatest success story of 2010 was Diplomat Specialty Pharmacy, said Tim Herman CEO of the Genesee Regional Chamber of Commerce. “This project is an excellent example of collaboration and partnerships at its best, and a prime example of what’s possible for our community,” said Herman. Hagerman said the company’s success gets down to taking specialty pharmacy back to what made the industry successful in the late 1990s and early 2000s. While competitors adapted a big business approach, Diplomat – despite dramatic growth – still operates like a small entrepreneurial company. For example, the company created a patient management system that was designed for speed and flexibility in making changes. So now when it gets a new contract or service agreement that can improve patient outcomes, Diplomat can make the programming changes and go live in days. Competitors can take weeks or months. The company also created physician notification programs that can go live immediately when new drugs are released. When a new cancer drug was recently approved, Diplomat put steps in place overnight to insure physicians knew about the availability and then led the nation in dispenses for the first month. Meanwhile, competitors were still launching their programs. “As a result, we've created a business culture that really aligns with our partners,” said Hagerman. “We've gotten large enough in terms of capabilities that people believe in and trust us now. And now with this new facility, it becomes a game changer in terms of our capabilities to serve much larger clients." “So what we're doing is creating a new model in our industry, using technology and business attitude to deliver services that other companies think economically they can't deliver." The company has also been successful looking for opportunities within the industry where patients and business partners are underserved, and then taking advantage of that lack of service in that area by creating a product or a process that wins business. 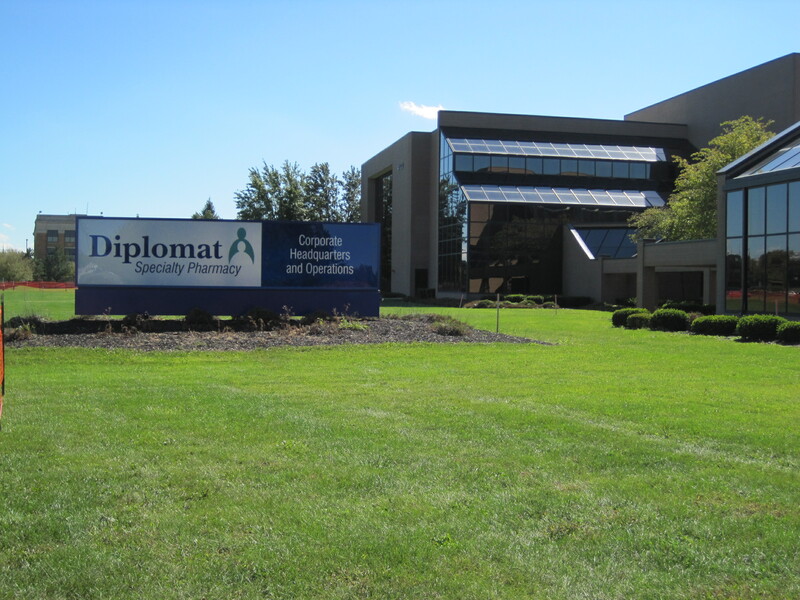 Diplomat's competition is the big chain and mail order pharmacies and prescription benefit managers with specialty divisions, such as Walgreen's. "Our advantage is our ability to remain nimble and stay entrepreneurial,” said Hagerman. In 2009 and 2010, Diplomat Specialty Pharmacy was named to INC. Magazine’s list of the 500 fastest growing, privately held companies in America. And it recently won a Corporate Investment and Community Impact Award as one of the 15 most impactful economic development projects in the nation based on criteria that include job creation, job retention and investment. Anytime Flint is the topic, discussion inevitably turns to the condition of the city itself. Diplomat is cognizant of the challenges in Flint and sees its primary effect in being the strongest business it can be. "We did look at the home opportunity as we thought we could acquire homes from the Genesee County Land Bank and fix them up and sell at cost to our employees," Hagerman said. "We found many had been completely stripped and needed more money put in than the value would support. Our current efforts are around supporting local businesses and using our employee traffic to support local businesses. We are developing a ‘community corner’ area within the company so employees can see info about local companies and support them as well as using Flint vendors whenever possible. As we continue to grow we expect to create more opportunities to support our community." As a life sciences company, Diplomat is among Michigan’s targeted industries for growth and diversification. "We're in an exciting space in our industry,” said Hagerman, “and I think it's very powerful that Michigan has made the commitment to life sciences in an area that clearly has some great growth ahead of it -- not just at Diplomat, but as in industry in general."